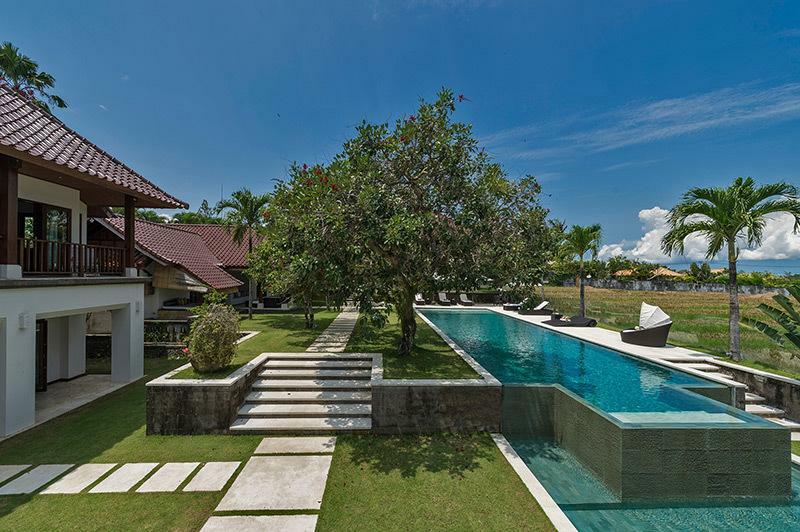 Villa Manis is a beautifully designed, eight-bedroom home located amidst the rice fields less than a kilometre from the beach in Bali’s popular Canggu district. A full complement of staff, including a manager and private chef, will see to their guests’ every need, while a 17-metre swimming pool, a kids’ pool, gym, spa, formal dining and sitting room, media room with 60-inch TV, two outdoor lounges and alfresco dining, provide fun, entertainment and plenty of space for all to enjoy. 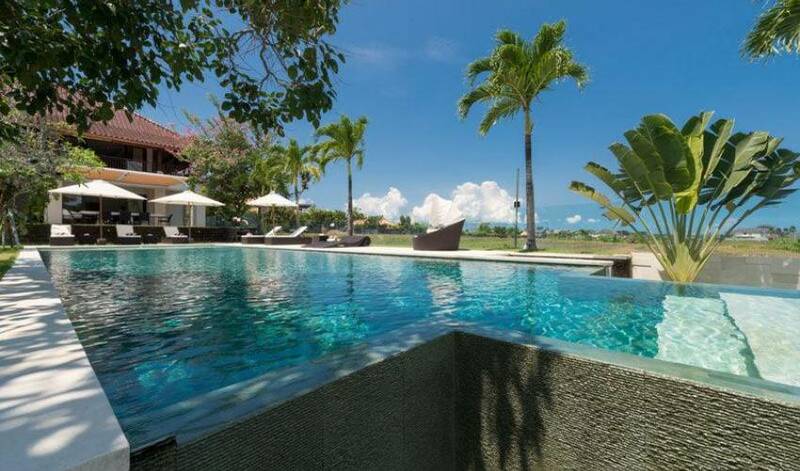 Suited to large families or groups, the villa is also ideal for weddings and other special celebrations. 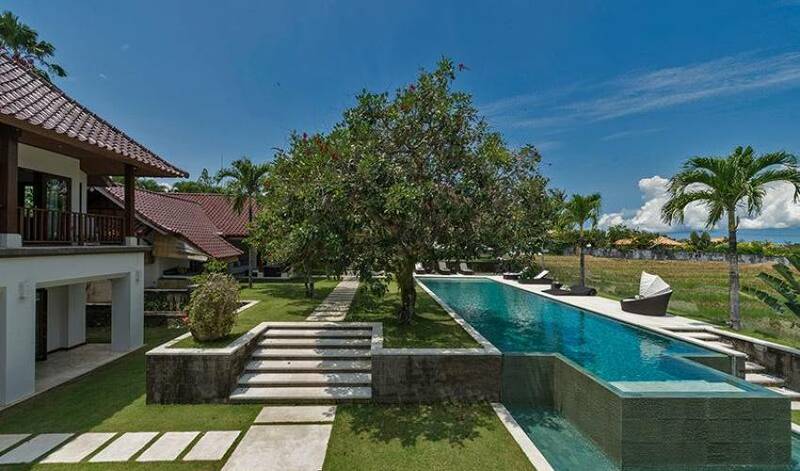 Located less than a kilometre from the beach in Pererenan, a traditional village in the heart of Bali’s sought-after district of Canggu, this villa is packed with facilities for young and old, offering you so much more than just a place to stay. Dine alfresco in the sun-drenched gardens, swim in our 17-metre swimming pool while the kids frolic in theirs, relax in the jacuzzi, recline in the massive living room with it’s many sofas and splendid painted ceiling, chill out in the air-conditioned TV room, or head to one of two outdoor living areas, hit the gym, relax in the spa, or simply enjoy your room’s private terrace or balcony – there are plenty of places to hang out with the crowd or seek some serene solitude. What makes a stay here even more special is our team of dedicated staff who are on hand to make sure that everything is taken care of, leaving you free to get on with the task at hand: having a perfect holiday. Your private chef will prepare delectable dishes from around the world or rustle up a seafood barbecue or a traditional Balinese feast, and is also open to special dietary requests. 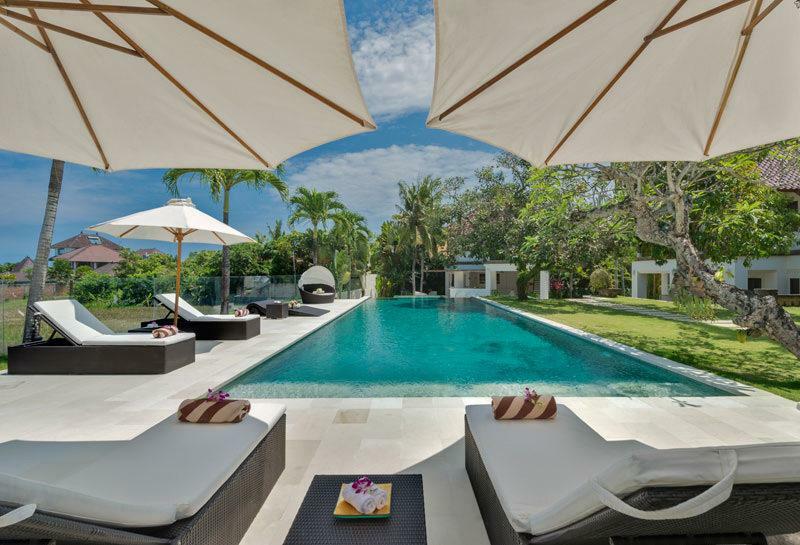 The villa comprises four pavilions set around a large, tiered garden and swimming pools orientated towards the ocean and an expanse of neighbouring rice fields. Guests enter through the main pavilion, which houses the indoor living and dining room and a guest bedroom and media room on the ground floor, plus a kitchen set to the rear. The upper floor of this pavilion is dedicated to a large master suite with private ocean-view balcony. Two ground-floor guest bedrooms occupy the second pavilion, either side of the villa’s spa. 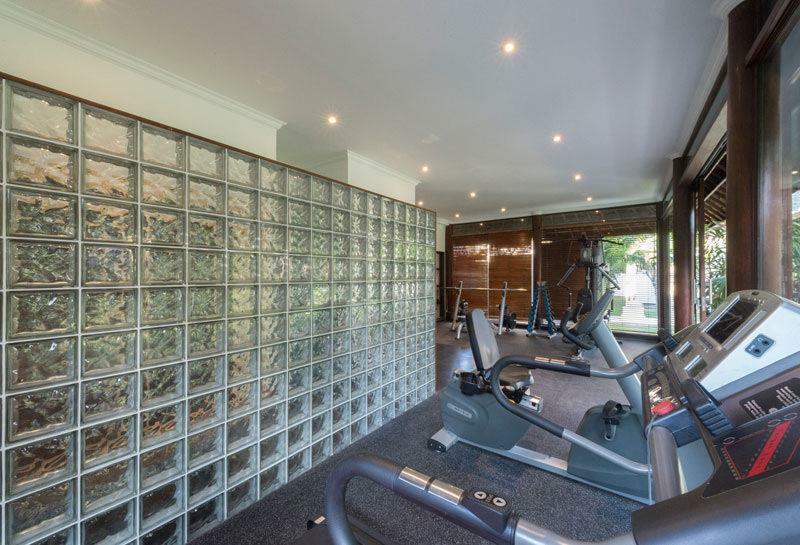 Next to this is a two-storey pavilion with two bedrooms, one on each floor. At the far end of the garden is the fourth pavilion which houses the pool lounge and jacuzzi on the ground floor and two twin bedrooms upstairs. 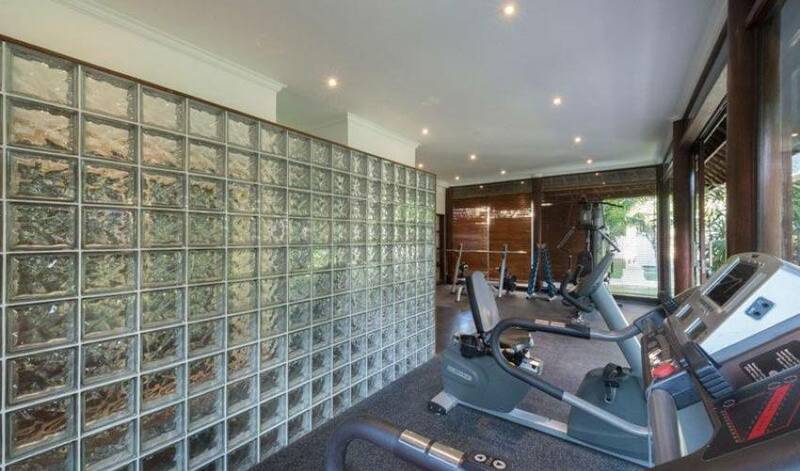 The gymnasium is located towards the rear of the villa, next to the manager’s office. The main pavilion combines a very spacious lounge, dining room and entrance hall adorned with original artworks and antiques. Sliding glass doors on two sides of this bright room lead out to the garden and overlook the neighbouring rice fields. In the dining space is a long table with seating for 12 and a bar area, while at the centre of the room, under an impressive double-height ceiling depicting scenes from Balinese mythology, is an arrangement of comfortable sofas, chairs and coffee tables. A media room with cosy couches and a 60-inch TV adjoins the far end of this elegant living space. On a terrace alongside the pool, is a dining table for 12 sheltered by a retractable awning to keep the tropical sun at bay. Outside the spa under a high wooden ceiling is a sitting area with soft sofas and chairs arranged next to a koi pond. 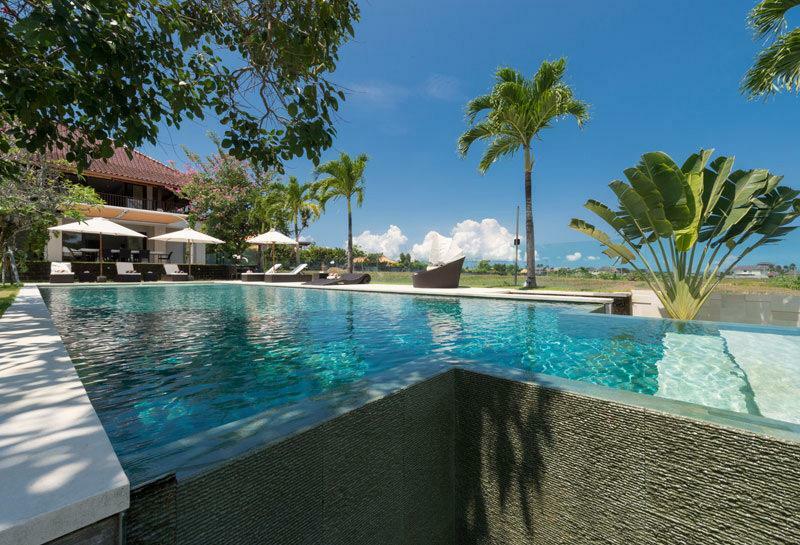 It looks out over the garden and pool and is positioned to catch the sea breezes. At the far end of the property is a cool, white-themed, open-sided pool lounge, furnished with leather sofas, coffee tables and a drinks bar, as well as a white stone jacuzzi. 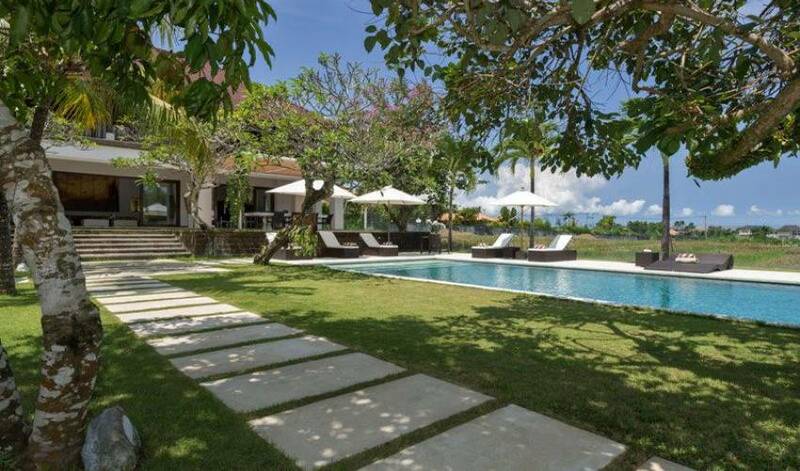 All eight bedrooms at Villa Manis are equipped with TVs, air-conditioning, ensuite bathrooms and are furnished with either king beds or twins that can be converted to kings. More than just a master suite, this room takes up the entire first floor of the main pavilion and features a massive sleeping chamber with ocean views from its bed. The suite’s private wrap-around balcony is furnished with daybed, tables, chairs and more views, while the ensuite bathroom, complete with jacuzzi tub, leather sofas and chairs, is bigger than an average inner city apartment. Just off the living room, the first guest room is lots of fun, with coloured Buddha statutes, hardwood and terrazzo floors, furniture inlaid with cinnamon wood, and a splendid four-poster bed with orbs of many colours forming its uprights. Sliding doors let in lots of light and access a private courtyard, while an outdoor shower and purple velvet sofa in the bathroom make bath time something to look forward to. Guest rooms two and three sit either side of the villa’s dedicated spa and luxuriate under lofty ceilings. These rooms open to their own sitting area and to the garden and pool. Both are designed to the same layout and furnished with twin beds (convertible to kings), and both have sunny outdoor showers in their ensuite bathrooms for a great start to the day. King-bedded guest rooms four and five occupy one floor apiece in a two-storey pavilion. The lower room is spacious and dramatic with elegant velvet chairs and couches and dark hardwood floors, countered by a bright and sunny outdoor shower in its ensuite. The upper room has a four-poster bed and a lighter décor and, while not as big as downstairs, has a breezy private balcony overlooking the garden and out to sea. Both rooms have fold-out couches suitable for sleeping a child. Guest rooms six and seven are located upstairs in a pavilion at the far end of the villa grounds with views of the rice fields or garden. Both of these ensuite rooms are furnished with twin beds that can be converted to kings. While they are smaller than the others at the villa, these bedrooms are comfortable and well suited to a family of four who want to be close to the kids. 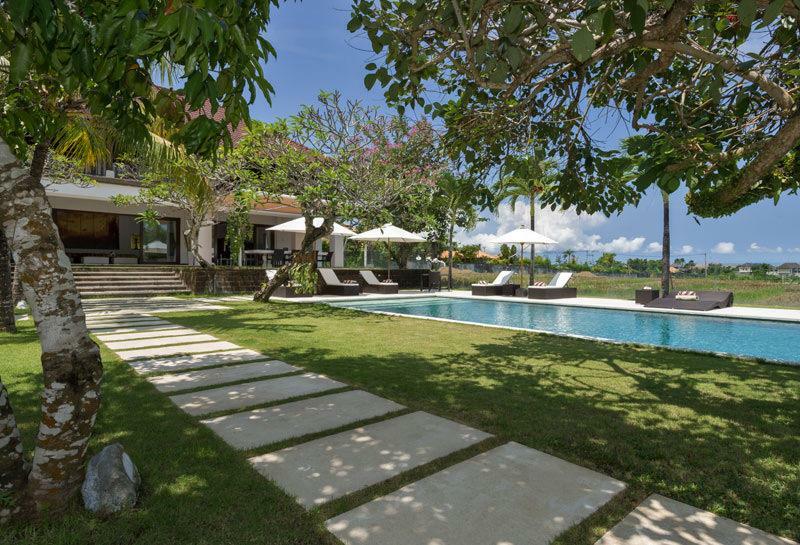 Vila Manis is located in the village of Pererenan in the north Canggu area. 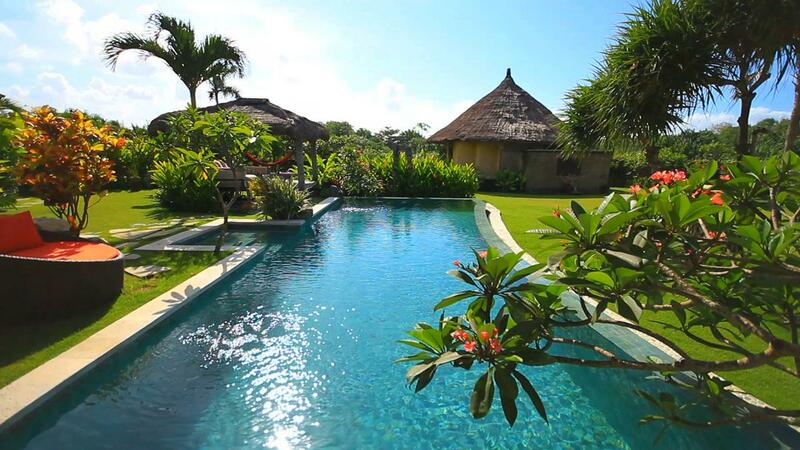 In the immediate vicinity are a few neighbouring villas, rice fields, coconut palms, temples and the general buzz of Balinese village life. The rugged Pererenan surf beach is less than a kilometre from the villa; here you will find a couple of cafés that serve simple food and offer great sunset views. 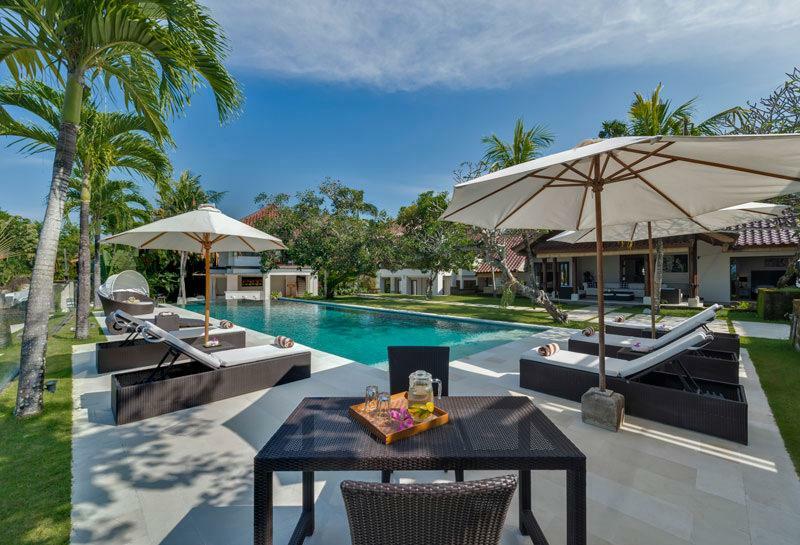 Less than half an hour away – and easily accessible thanks to the villa’s complimentary car and driver – are the many restaurants, bars, boutiques, clubs and cafés of chic Seminyak.